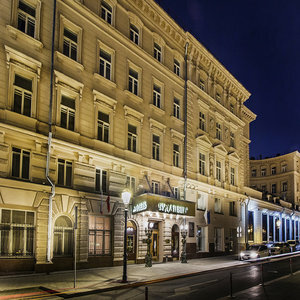 The Budapest Hotel is situated in the heart of business and cultural centre of Moscow. The following buildings are just in several minutes walk from the hotel: the State Duma and the Council of Federation, the City Duma and Moscow Administration office, several federal ministries and agencies, the Central Bank of Russia. Many famous theatres and museums are located in immediate proximity to the hotel: the Bolshoy Theatre, the Maly Theatre, the Theatre of Musical Comedy, the Musical Theatre, the New Opera, the Historical Museum, the Modern Art Museum, the Museum of History of Moscow, the "Manezh" Central Exhibition Hall. The key attractions of the Russian capital - the world famous Red Square and the Moscow Kremlin with the Armoury Chamber and the Diamond Fund are located just a few blocks away from the hotel. The largest shopping centres of the capital - GUM and TsUM department stores, Petrovsky Passage shopping mall, "Detsky Mir", "Okhotny Ryad" - are within 5-10 minutes walk from the Budapest Hotel. 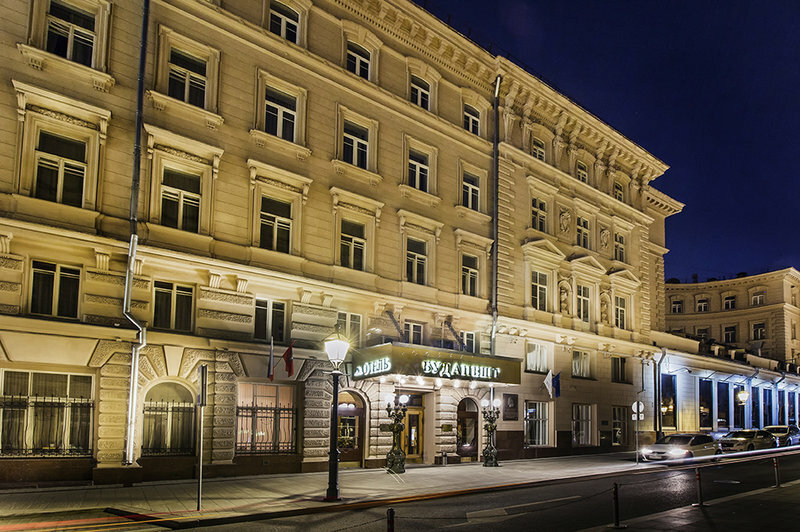 The Budapest Hotel is housed in a late XIXth century neo-classical edifice constructed in 1876 and refurbished in 2005. Elegant spacious rooms - each with unique layout - professional staff, moderate prices and broad payment alternatives make the Budapest Hotel an astute choice for the traveller looking for a cozy, friendly and quiet oasis in the never-sleeping metropolitan environment. All the 116 guest rooms are air-conditioned and equipped with a bathroom or a shower, telephone, satellite TV, Internet facilities, minibar, safe deposit box and a hairdryer. Continental breakfast is served in the room at the time selected by the guest and is included in the room rate. The Irish Pub and a lobby bar offer light snacks, hot dishes, beer on tap, hard and soft drinks, cocktails, tea and coffee. Three well-equipped conference rooms for 15, 20 and 70 people as well as a round the clock business centre add extra value to the hotel's service. Other amenities include air, train and taxi desk, car rent, airport transfer and guided tour service plus theatre tickets reservation.